Silver, Golden, and some Tabby Persians and Exotics often have a step in their grooming routine usually not shared by the other color divisions — nose shaving. Part of the standard in the Silver & Golden division is a reference to “Rims of eyes, lips, and nose outlined with black”. 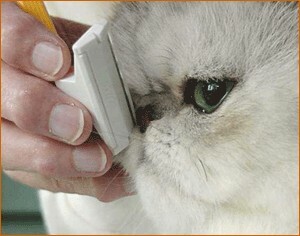 This is what breeder’s call the cat’s “mascara”. Incomplete or poor mascara is penalized in the show ring. Therefore, exhibitors of well-presented Silvers and Goldens take care that the mascara on their cat’s nose leather is not obscured by hair along the edge of the nose leather. The best way of emphasizing good nose mascara is by shaving the hairline around the nose. 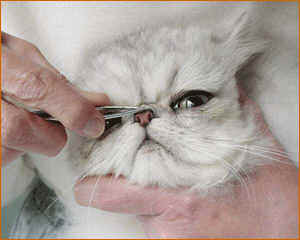 The photo above is of 7 month old Shaded Silver Persian, Missionhill Infinite Wisdom. Notice how beautifully the line of black mascara outlines his nose. If left unshaved, the hair would eventually cover the entire black liner. To control the growth of the hair covering the mascara, we will shave the hair away from the edges of the nose leather. This may seem a little daunting to the first time groomer, but with a little care and a little know-how, it is easier than you think. 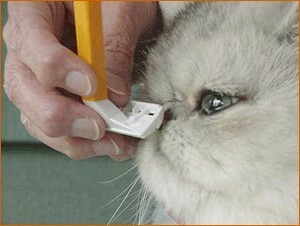 assemble the things you need to shave your kitty’s nose. Hibitane – in case the nose is nicked while shaving. Of course, it also comes in useful if dealing with an unpredictable cat who bites the hand that shaves him, then the Hibitane would be applied to the bitten hand. Pears Soap – I like using Pears because it doesn’t lather. Any soap or shampoo can be used to assist in getting a smooth shave. 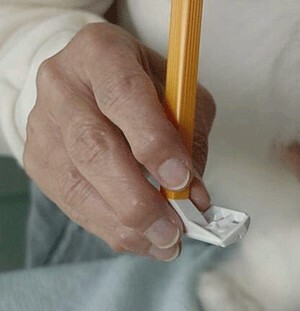 Razor – A single edge BIC razor works best. It must be sharp. 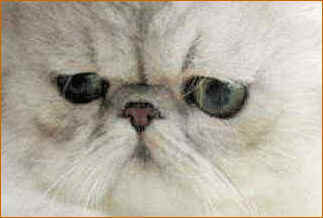 A dull razor irritates the sensitive nose of a cat and doesn’t do as good a job. A container to hold hot water if you are not working on a counter near a tap. Cotton pads – I cut each round pad into 6 pieces. I find this a convenient size to work with and is also much more economical than using a whole pad. 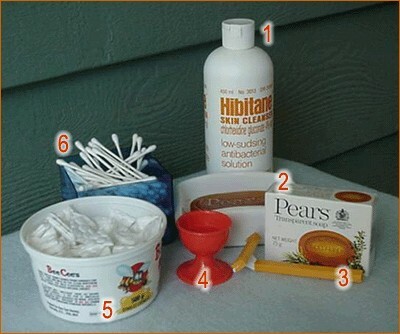 Q-tips – for applying soap to the nose. 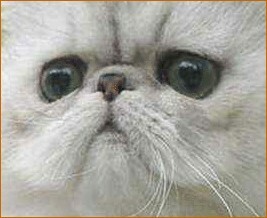 The best time to shave a cat’s nose is immediately after bathing. With the cat wrapped in a towel and happy to be over the ordeal of a bath, the nose shaving is usually an anticlimax and can be done very quickly with the cat raising no objection. This is also a good time to remove any plaque from the teeth. Take a Q-tip and dip it in hot water first. 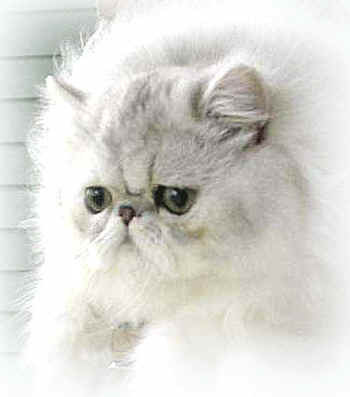 Cats don’t like to get soap in their nostrils so the Q-tip should not be dripping wet. Then rub the end of the Q-tip on the Pears soap. 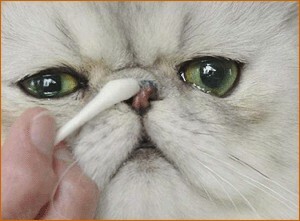 Rub the soapy Q-tip lightly all around the cat’s nose, being sure to soap slightly beyond the edge of the nose leather. Hold the razor low at the base to get maximum control. You should have a very firm hold on the head of the cat. However it is very important that the razor is held gently and your wrist should be loose and flexible. With a loose wrist, if the cat jumps, the razor will simply bounce off. If it is held rigidly then the cat can be hurt if he pushes up towards it. Dip the razor in hot water – warm steel on your nose is much more comfortable than cold steel. I have the cat held against my bosom (taller people would have the cat held against their midriff!) and facing away from me. I am right handed so I position the cat so it is facing away but slightly to the left, around the 10:00 a.m. to 11:00 a.m. position if it were the small hands of a clock. I bend my head right over the cat, looking down on it from the top. I need to bend really close to see what I am doing because you can’t afford to make the slightest mistake. Both sides of the nose must be absolutely even. I start shaving with light, quick strokes right in the center of the nose, but not going up as high as I eventually want it to be. I then shave the 2 sides so the side liner is the same width as the center liner. A quick frontal check to make sure that everything looks balanced and then I finish the center shaving and pluck any hairs from the crease between the nose (if there is one). If you shave the nose too high, then it no longer looks natural. A little looks good, too much looks artificial! 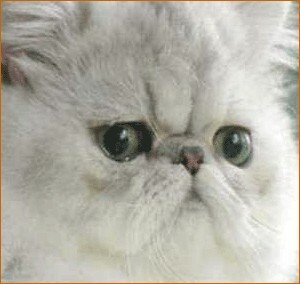 With most silver Persians there is no danger of shaving any hair which is not on the nose. With very extreme silver Persians you have to be extremely (pardon the pun) careful not to damage the eyes. I have a couple of cats whose noses are in direct line with the eyeballs. When the nose is very short, the break is very deep and the eyes are very large, there is a real danger of nicking the eye during shaving. If you have any doubt about your ability to shave the nose safely, it is better to pluck the hairs instead. When shaving these noses I frequently change the position of the razor so that I don’t use the center for shaving, but one end of it. I position my fingers so that I protect the eye on the side I am working from (this would mean the right eye for right handed people). When shaving the right corner of the nose, I angle the razor up and out, using the right side of the razor. Turn the shaver sideways and shave from the center of the nose out to the sides. 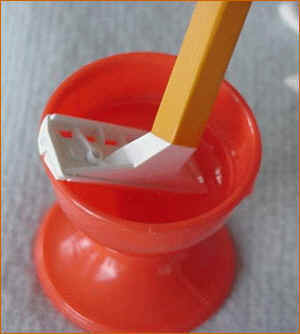 Use the corner of the shaver to reach into the corners of the nose. When shaving the bottom left side of the nose, I angle the razor so that I use the left side only. On a longer nosed silver I use the center of the razor for shaving the center of the nose. If you notice, the nose appears to be heart shaped after being shaved. Some silvers, this one included, have a little dip (crease, dimple, whatever you want to call it) running up the center of the nose. It is not possible to shave this part, even if you try stretching the nose apart. The only way to deal with this is by using a pair of tweezers. Tweeze from above or below. 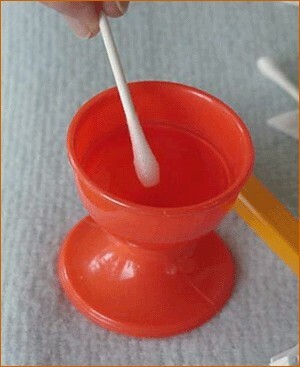 The tweezers can also be used to remove the bits of hair on both sides of the base of the nostrils if desired. My cats are wonderful for having their noses shaved. I am always very relaxed when I do this and I think this also helps them to feel relaxed and secure. If you have a cat that is tense it is a good idea to rub his ears, stroke him under the chin and kiss him on his nose, gently talking to him all the time. 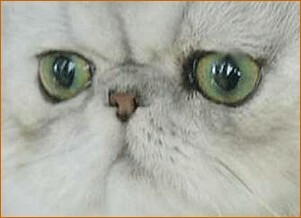 Making eye contact while you do this reassures the cat that there is nothing to worry about. You may also want to consider using this technique if a cat appears to have a low nose-set. 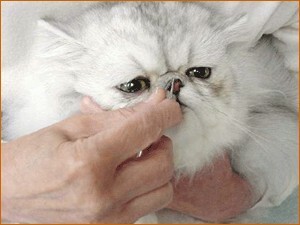 Shaving the nose will definitely make the nose look shorter and higher on this type of cat. 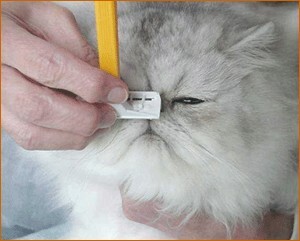 So… there you have it… How To Shave Your Cat’s Nose!